HOUSTON - Off of Curacao, a huge tanker has been bobbing in the water with its cargo of crude oil for five months waiting to get paid -- the latest sign that Venezuela’s cash crunch could get a lot worse as more debts come due. Petroleos de Venezuela SA, the state-owned oil company that controls the world’s largest crude reserves, has been hit hard by low prices and U.S. sanctions that are increasing the risk of default on the country’s debt. Output plunged, and refineries were forced to shut because of recurring breakdowns or a lack of domestic crude to process. On Friday, a principal payment is due on some of PDVSA’s notes. While the financial and political crisis has already wrecked the economy, a default by PDVSA could make things even worse if the experience of another oil exporter in South America is any guide. In an August 2016 report, the chief economist at Torino Capital LLC said Venezuela risked following the same pattern as Ecuador, which was forced to offer bigger discounts on its oil exports to lure buyers in 2008 after it was unable to pay debts. Venezuelan shipments to American refiners are down 35 percent since late August. The slump began after the U.S. imposed sanctions to punish President Nicolas Maduro for moves deemed anti-democratic. PDVSA is the government’s biggest source of export income. The sales decline is compounding a lack of revenue from exports to China, India and Russia, which are receiving crude as payment for earlier loans. 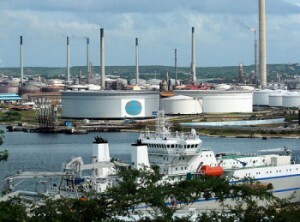 Finances are so tight that the refinery in Curaçao, which is operated by PDVSA, can’t afford to buy enough oil to process. The tanker Tulip, loaded with U.S. crude, has been drifting offshore since May awaiting payment. At the end of last year, PDVSA owed $42 billion. More than $2 billion of the company’s debt is coming due in the next few days, and investors are showing less confidence that funds will be transferred. On Thursday, PDVSA’s dollar bonds fell more than 4 cents with yields on notes due 2020 jumping more than 2 percentage points to 17.3 percent. Venezuela is already two weeks late on coupons for a slew of other bonds.